These are 100% natural diamonds. Classic and super affordable way to show your love. Free re-sizing available ask for it. Free LED light ring proposal box. Clarity Grade: VS1. Shape: Radiant. Certification Lab: GIA. This beautiful radiant cut diamond solitaire carved filigree wedding rings set has a GIA Certified 0.70 Ct Cut:Very Good VS1 Diamond. These are 100% natural diamonds. Classic and super affordable way to show your love. 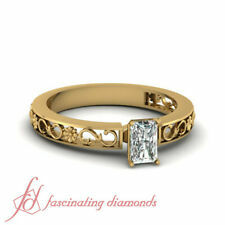 Center Stone Details :- Carat : 0.71 Ct., Cut : Radiant Cut, Color : D, Clarity : SI1. Shape: Radiant. Total Carat Weight :- 0.71 Ctw. Total Carat Weight.71 TCW. Solitaire With Accents. Carat Weight.71 TCW. We also give you the option to customize this ring ?. Free Re-sizing. Shape: Radiant. Solitaire With Accents. Total Carat Weight.73 TCW. Carat Weight.73 TCW. Country of Manufacture: United States. 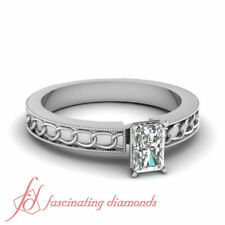 Luxurious in style, 14k white gold cathedral engagement ring features 0.56 carat square radiant cut diamond. This diamond was certified by AGI labs as a Genuine and Natural Diamond, D color, VS2 clarity enhanced and Excellent Symmetry. To highlight the spark of the jewelry our master jeweller chose 4-prong setting. This ring comes with an independent diamond report and an insurance replacement value of $2,566. At 47 Diamond District, your satisfaction is guaranteed and your money is fully protected by our 30-Days 100% money back guarantee. Center Stone Details :- Carat : 0.50 Ct, Cut : Radiant Cut, Color : H, Clarity : VVS1. Shape: Radiant. Gemstones Sapphires: The sapphires we use for crafting our jewelry are natural and heat treated to match color vibrancy and zoning and are entirely eco-friendly. 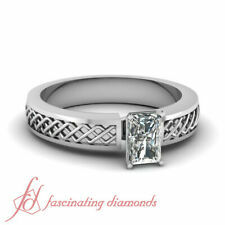 Center Stone Details :- Carat : 0.52 Ct., Cut : Radiant Cut, Color : I, Clarity : VS1. Shape: Radiant. Total Carat Weight :- 0.52 Ctw. Total Carat Weight.52 TCW. Solitaire With Accents. Carat Weight.52 TCW. 0.70ct I-SI1 Ex Radiant Natural Diamond 950PL. This diamond was certified by AGI institute as a 100% Genuine Diamond, I color, SI1 clarity enhanced, with Excellent Cut and proportions. Solitaire Rings. Center Stone Details :- Carat : 0.50 Ct, Cut : Radiant Cut, Color : H, Clarity : VVS1. Shape: Radiant. Total Carat Weight :- 0.50 Ctw. Total Carat Weight.50 TCW. Solitaire With Accents. Carat Weight.50 TCW. H and Clarity -VVS1. Shape: Radiant. Certification Lab: GIA. Solitaire With Accents. Gemstones Sapphires: The sapphires we use for crafting our jewelry are natural and heat treated to match color vibrancy and zoning and are entirely eco-friendly. H and Clarity -VVS1. Shape: Radiant. Solitaire With Accents. Gemstones Sapphires: The sapphires we use for crafting our jewelry are natural and heat treated to match color vibrancy and zoning and are entirely eco-friendly. 18K Gold 0.60 Ct. Take a look at our high-quality diamond pendants in a wide range of designs. Choose from Round or Princess Cut rings. Simply put, JewelryONet is unmatchable in quality, quantity, price or service, and we are here to create luxury and beauty for you that will grow in value and last for generations. From Our exclusive Designer Collection, this 18k yellow gold cathedral single stone ring showcases 0.72 carat square radiant cut diamond. This diamond was graded by AGI labs as a Natural Earth Mined Diamond, I color, SI1 clarity enhanced, with Ideal Cut and proportions. To bring out the radiance of the piece our master jeweller used 4-prong setting. The certificate that comes with this ring indicates the 4C's and the appraised retail value of $4,391. At Extra Brilliant, your satisfaction is guaranteed and your money is fully protected by our 30-Days 100% money back guarantee. 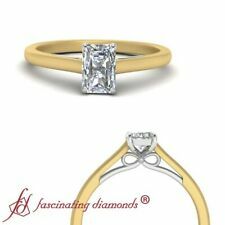 0.72 Carat Radiant Cut Diamond ring G vs2 Beautiful Model 100% Natural. this is an impressive 0.72 ct Radiant shaped Solitaire diamond ring with great size and sparkle. The diamond is polished in the most professional way. These are 100% natural diamonds. Classic and super affordable way to show your love. Free re-sizing available ask for it. Free LED light ring proposal box. Shape: Radiant. Solitaire With Accents. Diamonds: At Fascinating Diamonds we give surety that diamonds herein are procured from legitimate sources not involved in funding conflict and in compliance with the United Nations Resolutions. You can avail GIA certified and natural conflict free diamonds at Fascinating diamonds. Shape: Radiant. Total Carat Weight.50 TCW. Carat Weight.50 TCW. Diamonds: At Fascinating Diamonds we give surety that diamonds herein are procured from legitimate sources not involved in funding conflict and in compliance with the United Nations Resolutions. I ,Clarity ?. Diamond Setting ?. Prong Set ?. certified diamond rings ?. Easy Financing Available ?. More than 15 yrs experience. you can never go wrong with Fascinating Diamonds. Shape: Radiant. This diamond is E color, VS1 clarity and weighs. 54 carat. Center Stone Details :- Carat : 0.50 Ct, Cut : Radiant Cut, Color : F, Clarity : VS2. Shape: Radiant. Total Carat Weight :- 0.50 Ctw. Total Carat Weight.50 TCW. Solitaire With Accents. Carat Weight.50 TCW. Rose gold solitaire rings, engraved solitaire rings, solitaire milgrain rings, single diamond ring. 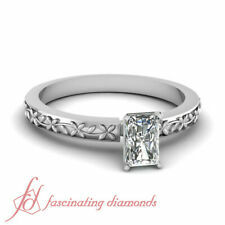 Center Stone Details :- Carat : 0.60 Ct, Cut : Radiant Cut, Color : I, Clarity : VVS2. Shape: Radiant. Which is enhanced by a glossy narrow knife edged ring adding to the stylish appeal. These are 100% natural diamonds. Classic and super affordable way to show your love. Free re-sizing available ask for it. H and Clarity ?. Shape: Radiant. Solitaire With Accents. Diamonds: At Fascinating Diamonds we give surety that diamonds herein are procured from legitimate sources not involved in funding conflict and in compliance with the United Nations Resolutions. H and Clarity ?. More than 15 yrs experience. you can never go wrong with Fascinating Diamonds. Shape: Radiant. Certification Lab: GIA. Solitaire With Accents. Diamonds: At Fascinating Diamonds we give surety that diamonds herein are procured from legitimate sources not involved in funding conflict and in compliance with the United Nations Resolutions. Main Diamond Shape :- Radiant Shape. Main Diamond Color:- Yellow. Main Diamond Type:- 100% Natural. Main Diamond Specifications:-. Main Diamond Weight:- 0.55 Cts. Main Diamond Size :- 4.00 4.80 3.00 MM. These are 100% natural diamonds. Classic and super affordable way to show your love. Free re-sizing available ask for it. Free LED light ring proposal box. Clarity Grade: VS1. Shape: Radiant. Solitaire With Accents. We also give you the option to customize this ring ?. Free Re-sizing. Shape: Radiant. Certification Lab: GIA. Solitaire With Accents. Diamonds: At Fascinating Diamonds we give surety that diamonds herein are procured from legitimate sources not involved in funding conflict and in compliance with the United Nations Resolutions. Free Re-sizing. Shape: Radiant. Certification Lab: GIA. Solitaire With Accents. Total Carat Weight.61 Ct. Carat Weight.61 Ct. Diamonds: At Fascinating Diamonds we give surety that diamonds herein are procured from legitimate sources not involved in funding conflict and in compliance with the United Nations Resolutions. These are 100% natural diamonds. Classic and super affordable way to show your love. Free re-sizing available ask for it. Free LED light ring proposal box. Shape: Radiant. Certification Lab: GIA. Solitaire With Accents.